In later years two significant features of Lucian Freud's paintings were the colour of flesh and the texture of the paint in the finished portrait. Freud used Cremnitz White to achieve both of these characteristics of his paintings of portraits and nudes. In the mid-1970s, he began using the heavy, granular pigment called cremnitz white, which he has since then reserved for the painting of flesh. I'd never heard of Cremnitz White before I read about this aspect of his technique - so decided to do some research - hence this post. Cremnitz White is made of lead carbonate (PbCO3) and is another name for for a particular type of Lead White - much loved of the old masters. Lead white is a warm yellowish white. It's called Cremnitz White because originally it was made in a town in a town called Cremnitz (by the Hapsburgs) which was formerly known as Kormeriz. Cremnitz White is a particular version of pure Lead White which gives it a stringy consistency. It comprises lead carbonate (white lead) and does not include the Zinc Oxide (as Flake White does) which helps it to dry quickly. Its actual performance and drying time depends on the oil it is mixed with - as explained below in relation to the three different variations of Cremnitz White supplied by Michael Harding. Click the relevant links to get a lot more information. It looks so much nicer in the tubes though! 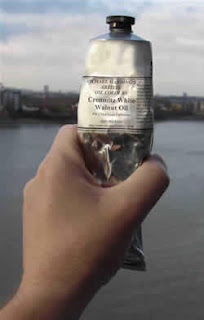 Cremnitz White No.1 (Linseed Oil) - describes as PW1. Fast Drying. Slightly Transparent. Lightfastness Excellent. Very Low Oil Content. TOXIC. Pure Lead Carbonate in a binder which makes a heavy, tactile white with a very robust surface. The ideal white for furrowed, granular or impasto mark-making. Cremnitz White No.2 in Walnut Oil described as PW1. Average Drying. Slightly Transparent. Lightfastness Excellent. Very Low Oil Content. TOXIC Walnut oil was used in the fifteenth century by artists such as Van Eyck and as the oil used in paints used by the Impressionists. Its reputation is that it yellows slightly less than the linseed oil. Cremnitz White No.3 with driers described as "PW1. Fast Drying. Slightly transparant. Lightfastness Excellent. Very Low Oil content. TOXIC"
This is how Cremnitz White is supplied by Michael Harding ie you have to use a tool to extract it. Old Holland (tins only / cold pressed linseed oil) This thread on the Wet Canvas site suggests it yellows somewhat. - see Cremnitz white turns yellow grey! Will added zinc/titanium keep it white? Lead is very toxic and hence precautions have to be taken over its use. It's impossible to buy the dry pigment. The European Union has passed a directive controlling lead paint use - mainly affecting the way it can be handled and sold when used as artists materials and methods for its disposal. i] Products labelled as toxic require child resistant closures if sold to the general public. ii] Products labelled as toxic require tactile warnings of danger if sold to the general public. Flake White, Foundation White and Cremnitz White can no longer be supplied in tubes. These products are available in 150ml childproof tins. Each tin is labelled with mandatory warnings and a further special instructions leaflet is provided in the outer box. These products will not be displayed on open shelves. They will either be behind the counter or in a locked display. Hmmm. Very interesting. I wonder if the difference between the results of the toxic pigment and a non-toxic pigment were sufficient to make it worth the risk. Plan to discuss this with paint manufacturer friend - just out of interest. Do you know how Freud died? Did it have anything to do with the Cremitz white toxicity? I think he also smoked while working and didn't wear gloves -gives one pause! Sharon - if anything his working practices rather go to support that there has to be an exception to every rule. He died age 88 having painted virtually every day - for two sessions a day (morning and evening) for DECADES. So at a rough guess he spent the equivalent of normal working hours using a toxic paint - and smoking. I think I read somewhere that his death was due to respiratory arrest (he stopped breathing) - but as you may be aware that's associated with a number of conditions - one of which is "old age". No - the friends and family thing is to do with the psychology of the man. He tended to only like painting people he likes and knows very well. Those that sit get interviewed before sitting! Very interesting article - best I could find about the topic of current lead whites. In Amsterdam at least I found the brand of Old-Holland to sell Cremitz White and Flake White No.1 in small tubes (40ML). I bought lots of them, and will try them over the next months. The Flake white works well so far, but I can't really say that I feel anything superior to Flake White Hue (from Windsor) that served me very well so far. Harding does not sell tubes at all anymore. Only the cartridges. Oh and on Freud: In the little video of his last painting session I see only Windsor colors - no Harding. Now that's interesting: so Cremnitz refers to Kroměříž / Kromeriz? That is a very pretty little renaissance town in what is now the eastern part of the Czech Republic. I think a Titian (?) painting used to, or maybe still does hang in the local castle. The flaying of Marysas or something like that it is called. Apparently the exemption for artist’s materials with lead was due to the lobbying of Freud himself! He had an acquaintance in the House of Lords who achieved the exemption through legislation.